Welcome to my pages, I hope you'll find them interesting and enjoyable. Fiji, officially the Republic of the Fiji Islands, is an island nation in the South Pacific Ocean, east of Vanuatu, west of Tonga and south of Tuvalu. The country occupies an archipelago of about 322 islands, of which 106 are permanently inhabited; in addition, there are some 522 islets. 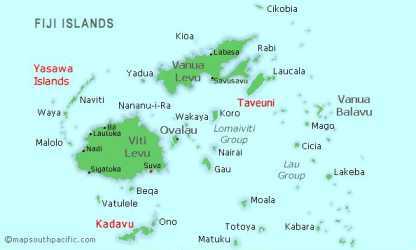 The two major islands, Viti Levu and Vanua Levu, account for some 87% of the total population. The name Fiji is the old Tongan word for the islands, which is in turn derived from the Fijian name Viti. The first inhabitants of Fiji arrived from South East Asia long before contact with European explorers in the 17th century. This academic question of Pacific migration still lingers. It is documented that Fiji was visited by the Dutch explorer Abel Tasman in an attempt to find the Great Southern Continent in 1643. It was not until the 19th century, however, that Europeans came to the islands to settle there permanently. This information was correct in November 2006. E. & O.E. Well, it was only the beginning of the winter in New Zealand and we had extremely bad whether right from the beginning. Bitterly cold in Auckland's mild climate and snowstorms damaging power supplies further south. So, Hui Chin and I packed our bags to thaw out for a few days in Fiji, seven days in fact. While in Fiji we had some rain, but nothing really to spoil our sojourne much. We did enjoy ourselves, and found the Fijians very friendly. Many times people were yelling at us from across the road "Bula". Fijian for Hello or Welcome. We hired a car for four days to drive around Viti Levu, the main island, looking at the cities, towns, villages, hamlets and the people in it. We did just over 600 km in our car and really checked the place out. Apart from a couple shopkeepers who cheated us and left a bad taste, we enjoyed the island, it's friendly people and our brief stay. Gutter-scums, like the shopkeapers that reaped us off are all over the world prey on tourist and reaping them off and giving their countries a bad reputation. Below our the links to my other Fiji pages and some photos of our travelling around. Here I would like to mention and express our grateful thanks to some very nice people we met working on the trains. I am very interested in trains and the Fijian 'sugar trains' are really one out of the box. Our grateful thanks to the many friendly people we talked to working on and with the trains, especially to Sundresan the driver and his deputy Tevita, who were kind enough to let us ride their train and give us a lenghty run down of the train's working, about their job and many other interesting insight into many other subjects as well. Thank you very much fellas. Hui Chin and I sure appreciate your kindness and friendliness. Other pages in my Fiji 2006 series.